Jonathan is an icon here. He is a grand old gentleman who has seen it all. He landed on St. Helena in 1882 as a fully grown adult; he has seen generations of people coming and going. 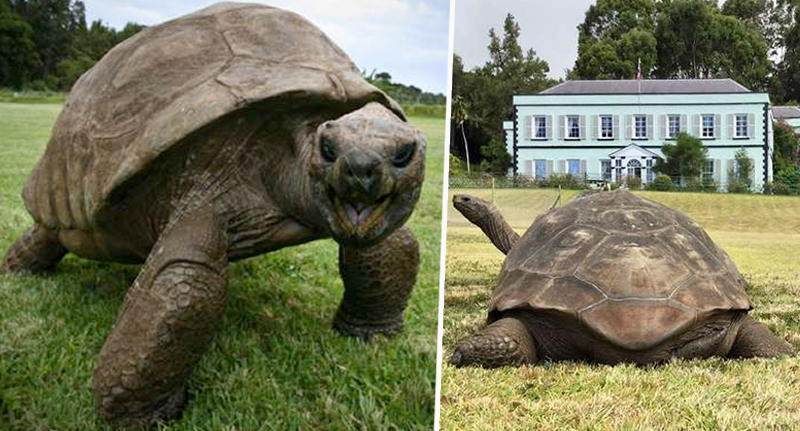 Being the oldest land animal in the world, he has almost royal status here. He is dignified and interacts in a friendly way as long as people move slowly around him. We are all very fond of him. We started feeding Jonathan on a weekly basis a few years ago to supplement his grass diet and boost his nutrition. This was because the island vet realized that his beak was soft and crumbly and that he was too cold and had lost weight. All that has reversed now and he is as fit as a fiddle! He knows my voice and he knows the vet’s voice and reacts by walking toward us. It’s all about the food!